Non-driven wheel bearings - the front-wheel bearings of rear-wheel-drive cars and rear-wheel bearings of front-wheel-drive cars - are similar in design, differing only in detail. 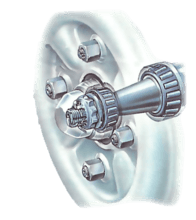 The bearings are located in the wheel hub on disc-brake wheels, and inside the brake drum, which forms part of the hub, on drum-brake wheels. They may be either tapered roller bearings or ball bearings. Both types need regular adjustment (See Adjusting wheel bearings) and lubrication with grease. Routine lubrication intervals are normally given in the car service schedule. They are usually very long typically three years, 36,000 miles or 60,000 km. But you may need to repack bearings earlier if a routine check shows that the grease is dirty. Eventually, however, bearings may wear out. A worn bearing becomes evident in various ways. There may be excessive play, which adjustment fails to cure. The bearing may be noisy, especially when cornering. Roller bearings are usually on driven wheels, with the hub nut tightened to a high torque. A spacer tube keeps the bearings apart. The noise may be a low-pitched droning at first; then, as the bearing wears more, a scraping sound; finally, just before it seizes, a high whine. Other signs of bad wear are the steering wandering or pulling to one side, shuddering or squirming during braking. Replace a worn or damaged bearing as soon as possible. Bearings are dismantled for greasing, so the procedures for lubrication and replacement are similar. Before either job, see that you have new grease seals for the bearings. Loosen the wheel nuts of the two wheels you are dealing with, raise the car and support it on axle stands. Chock the other two wheels. Release the handbrake if it works on the raised wheels. Take these wheels off. Support the brake caliper if it is connected to its hose. Pull off the thrust washer and outer bearing. Remove the dust cap and loosen the hub nut by the same method as for adjustment (See Adjusting wheel bearings). If a disc brake is fitted, move the caliper clear of the disc (See Renewing disc-brake pads) so that the disc and hub can be pulled outwards. Tie up the caliper so as not to strain the brake hose, if it has not been disconnected. On drum brakes, if the drum is separate from the hub, take off the drum (See Renewing drum-brake shoes). 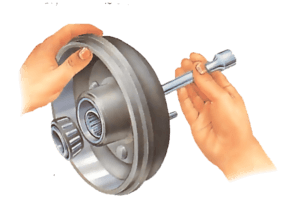 If the brake drum is not separate from the hub, it can be removed once the bearing is released. Unscrew the hub nut completely. Take off the large thrust washer under it to expose the outer bearing. If this is a tapered roller bearing, it will probably fall out (but if it does not, leave it in place). You should be able to pull off the hub or the hub-drum assembly by hand. If not, give it a few blows with a soft-faced hammer. Prise out the grease seal. Turn the hub outer side down and use a screwdriver to prise out the grease seal, noting which way round it is fitted. Take care not to scratch the seating into which the seal fits. Discard the old seal. If the inner bearing has come away with the hub, lift it out and SE it aside. If it has stayed on the spindle, free it with a few gentle taps of a soft-faced hammer. In many hubs there is a spacer ring between the two bearings. Put this with the other detached parts. With ball bearings, the inner and outer races of both bearings stay together when the hub comes off. Prise out the grease seal from the inner side of the hub as described above. Separate the inner race of each bearing by driving it outwards from the middle of the hub. Use a flat-faced punch passed through one bearing to rest against the inner face of the other. Give the punch gentle blows with a heavy hammer, moving it around the outer casing until it comes free. Some of the balls may drop loose, but most of them will stay embedded in the grease. Extract any spacer between the bearings. Bearings removed in this way must be replaced.